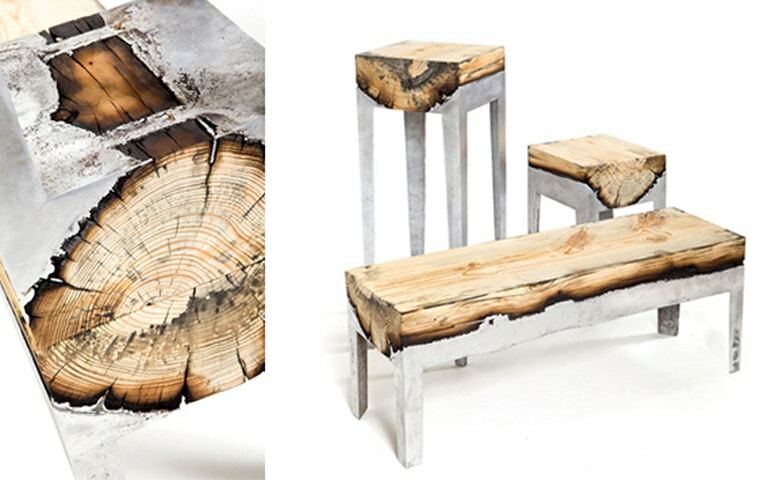 WOOD CASTING FURNITURE with ALUMINUM + TREE LOGS = FABULOUS! Wood casting takes my breath away. Nature’s raw beauty is reinterpreted in a sublimely modern way. The beautiful furniture shown was created by Tel Aviv based product designer Hilla Shamia who creates an unusual layer of carbon, combining raw cypress and eucalyptus tree logs with aluminum. “The negative factor of the burnt wood is transformed into aesthetic and emotional value”. The end result is a modern piece of furniture which preserves the natural form of the tree trunk and “the memory of the organic material and shape is present”. This wood casting technique has a lot of rich applications. We live in a fascinating time where technology and nature can unite to bring dynamic visual interpretations that are inspirational to me. It also allows us to use items once looked at as trash such as burnt wood and re-use it and highlight it’s natural beauty.